Stock market price data is readily accessible from a number of web sites. Popular data sources include Yahoo Finance, Google Finance, and msn Money. The time span of historical data available from these sites varies considerably, from the last 12 months for msn, to more than 50 years for Yahoo. The two sites with the greatest availability of data for download are Yahoo and Google. Both provide daily data for the Open, High, Low, Close, and Volume series. For major United States corporations, such as General Electric - Yahoo has daily data back to January 1962 and Google has data since 1970. msn, on the other hand, only has weekly data for last 12 months (sourced from Morningstar). Both Yahoo and Google provide a download link, but Google disables the download feature when Australian data is accessed. In contrast, Yahoo does not have this restriction, and this enables the user to download the full data selection from Yahoo as a CSV file. In contrast, Google displays Australian data with a maximum of 30 rows per screen, and the user needs to copy and paste each screen of data, screen by screen. International price data, that is, price data from outside of the United States is supplied to Yahoo by Morningstar. The Yahoo code for the ANZ bank is ANZ.AX. (i) Start to type the code in the Look Up field. Yahoo's suggestive search feature (ii) will provide a list of search suggestions in a drop down list. Select ANZ.AX from the list in figure 1. This will display the Historical Prices screen in figure 3. (i) In the Start Date: field select Jan 1 2010, and (ii) Dec 31 2013 for the End Date: field. Leave the radio button at Daily for daily prices. (iii) Next click Get Prices button to run the filter and update the data. Note that the Yahoo Start Date is earlier in time than the End Date. These may differ to the date orientation used in a number of Excel function referenced in the Stock Analyser project. Clicking the Get Prices button display the updated Historical Prices screen in figure 4. Depending on the file associations setting for your browser, clicking on the Download to Spreadsheet link might simply save the file as table.csv. The next download would then be table(2).csv (table.csv is renamed to table(1).csv), table(3).csv and so on. 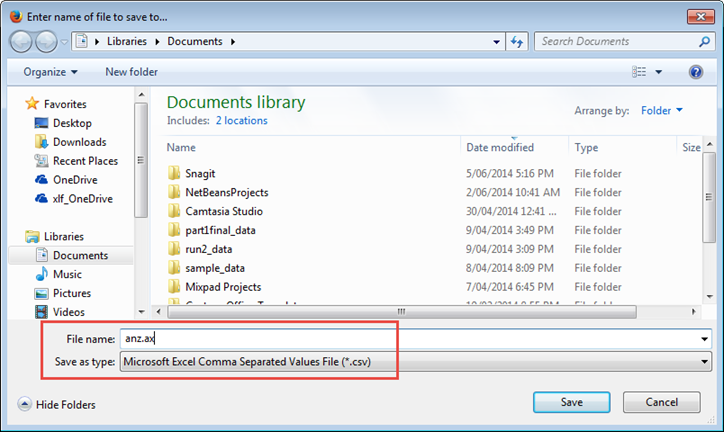 To name the csv file before saving, follow the steps in point 6. To name the csv file before saving, right click the Download to Spreadsheet link (figure 4 (i)). This will display the dialog box shown in figure 5. Now select the Save Link As item. 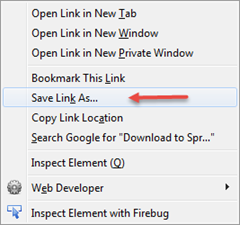 The Save Link As item will display the Enter name of file to save as dialog shown in figure 6. Enter the File name: anz.ax with the three character stock code and the two character Australian equity code, and Save as type: Microsoft Excel Comma Separated Values File (*.csv). Then click the Save button.